PHILADELPHIA (September 2, 2014) — A unique tropical tree. A seed so precious it was used as money. A spicy drink and a sweet snack. A multi-billion-dollar worldwide business. Chocolate is all this and much more. Indulge in the sumptuous world of chocolate starting Saturday, Oct. 11, when Chocolate: The Exhibition, opens at the Academy of Natural Sciences of Drexel University. Chocolate traces the intriguing story of this “food of the gods” from its origin as a unique tropical rain forest plant, to the Aztecs who used cacao seeds as currency, to the Spanish who added sugar and transformed the bitter drink of kings, to the sensuous sweet millions of people crave today. Chocolate brings to life the rich history and wide impact the treat has had across the globe. It’s a sweet experience that engages all the senses and reveals facets of chocolate most people have never thought about before. On view from Oct. 11 through Jan. 24, 2015, Chocolate is presented in both Spanish and English. There is a $5 fee to enter the exhibit in addition to regular museum admission. Visit the Academy’s website, ansp.org, for details about opening weekend festivities including chocolate foods and crafts presented with the Mexican Cultural Center to celebrate Hispanic Cultural Weekend. Stand beneath a cacao tree in a lush rain forest replica and examine cacao seed pods up close. Engage with animated modern-day machinery that turns cacao from seed to sweet, solid bar. Follow a cacao harvest on a Mexican plantation and cacao’s preparation for market. Barter cacao seeds for goods in an Aztec market and learn about Quetzalcoatl, the god who brought the sacred source of chocolate to the Aztec. Interpret glyphs on a royal Maya pot and see archaeological vessels that once held the drink of kings. Admire beautiful porcelain and silver chocolate services from Europe. Philadelphia has played a key role in the chocolate industry for more than 200 years and remains an important port for shipments of cacao and other ingredients used to make chocolate products. 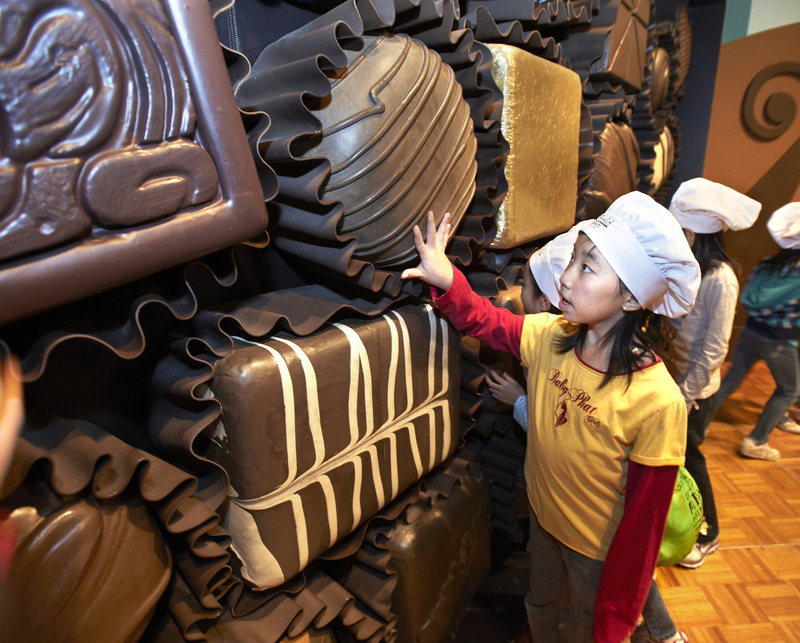 “The cuisine culture of Philly is one of the things that sets it apart, and numerous major chocolate companies are based in this region,” said Mary Bailey, special exhibits educator. Bailey and her team will augment the exhibit with mobile “touch carts” bearing teaching treasures including a real cacao pod, monkey fur, puff balls, chocolate midges, snake skin, an okapi skull, and easy-to-digest information about the rainforests where cacao plants grow. Fall marks the debut of a new type of educational cart for engaging visitors, one that Bailey calls the tech cart. “It has a digital screen where we can show magnified images, so groups of people can see dissections of flowers, fruits and pods and even look at the cells of an onion skin,” Bailey said. Visitors also will see up close a very tiny insect, a midge, on which the $50 billion-a-year chocolate industry depends. It’s a fly that closely resembles a mosquito, and many scientists believe it is the only creature that pollinates the cacao tree, Theobroma cacao. Without the midge, there would be no cacao plant. Another interesting aspect is that cacao is different from many other trees. It grows in the shade of larger trees in tropical regions of Central America, South America, Africa and Asia. It is relatively short—30–40 feet tall—and has lovely, delicate flowers that grow directly on the trunk and lower branches, where the low-flying midges can reach them. Today chocolate is known primarily as a candy or sweet dessert, mass-produced or cooked up in mom’s kitchen. But it wasn’t always so. The ancient Maya of Mexico and Central America (200–900 C.E.) knew it as a frothy, spicy drink, made from the seeds of the cacao tree and used in royal and religious ceremonies. The Aztec, between the 13th and 16th centuries, used the cacao seeds as money, and the chocolate drink was reserved for warriors and nobility for use in rituals and ceremonies. In the 16th century, the Spanish mixed sugar into the drink, and, almost a century later, the first English chocolate house opened. Chocolate: The Exhibition fills in the sordid, the fascinating and the fun details of chocolate, including stories involving slavery, World War II and myths about chocolate’s amorous effects. Complementing the exhibit, the Academy will present daily showings of Modern Marvels videos about chocolate, as well as special chocolate tastings and weekend programs. Chocolate and its national tour were developed by The Field Museum, Chicago. This exhibition was supported, in part, by the National Science Foundation. 6ABC is the Academy’s media partner.